According to the GCR’s latest analysis of TOP 10 Dental Clinics 2017 in LEBANON, Medic8 clinics Kaslik ranks as the leading clinic in Lebanon, when it comes to overall international clinic reputation. A total of 91 dental clinics were included in the study. The average GCR dental clinic quality score was 3.1, demonstrating the huge range of rising healthcare standards available in the country. The GCR – Global Clinic Rating, the leading provider of healthcare clinic ratings worldwide, aggregated and analyzed dental clinics throughout the Lebanon during 2017 including dental clinics in Beirut, Jounieh, Tripoli and others. Medic8 clinics Kaslik ranked #1 with a GCR Score of 4.43 and ranks #16 from 127,000 dental clinics monitored worldwide, followed by the Ferrari Dental Clinic Jounieh (4.31), the Bader Dental clinic (4.01) and Smile Poly Clinic (3.86). It is important to mention that all of this three clinics came out TOP (5.00) for their Facilities Score and Feedback Score (4.29-4.92). The government of Lebanon seeks to restore the country as a leading destination for medical tourists. As far back as 2001, the government set up a national commission for the development of health tourism with representatives from the ministries of health, tourism, environment, and information, as well as doctors, hospitals, hotels, travel agents and insurance companies. Thousands of patients from neighboring Arab countries used to go to Lebanon for treatment, but due to political tensions in recent years, the number of Gulf countries shrunk, which caused a decline in medical tourism numbers. Now, only Jordanians, Iraqis and some Arabs from African countries go to Lebanon. Lebanon has 161 hospitals, with seven university hospitals, while many hospitals and clinics are accredited to the ISO 9000 standard. Lebanon offers specialist services in orthopedics, spine treatment, organ transplant, and heart and arteries diseases plus advanced cancer treatment. Hospitals are an international standard for treating critical diseases and performing complex surgical procedures that require precision and experience. Specialist clinics offer cosmetic surgery and reconstructive surgery. The GCR clinic star symbol represents that the clinic has been officially verified as meeting or being above international medical clinic standards and uses the data provided by the GCR to constantly improve the clinic for their patients. Three clinics in Lebanon has achieved the GCR international accredited clinic status. 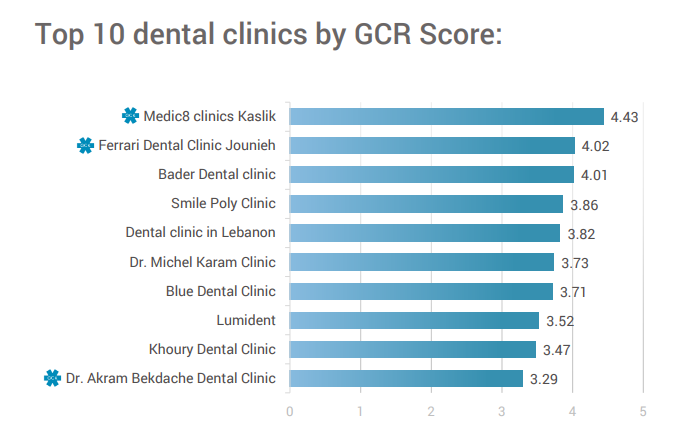 Download the GCR’s full TOP 10 Dental Clinics Report for LEBANON to discover the names of the other dental clinics that made it to the Top 10 dental clinic list in Lebanon and to find some brief statistics of these clinics.